The 2018 recipient of the BCom Medal – the annual award given to the highest achieving commerce student at the University - says the key to his academic success has been his genuine interest in economics. Peter Robertson, now doing the Economics Honours Program at the University of Melbourne, says the process of sitting down and studying was easy, because it was something he simply enjoyed. If I could give one piece of advice to BCom students, it’s to take subjects that interest you. That’s how I maintained interest in my degree and how I did well. 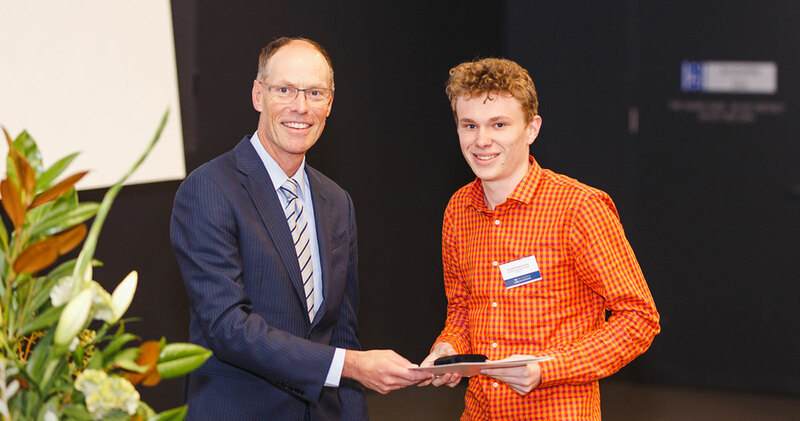 Peter was awarded the medal at the Dean’s Award Ceremony on 23 March 2018, where the highest achieving Bachelor of Commerce students are honoured across all years of study. Speaking to Peter, his passion for economics is obvious: “Economics sets up a coherent framework in which you can analyse social questions. I’ve always been interested in the ways people behave and the way they interact – and those are the kinds of questions that economics tries to answer, from business to society to the macro-economy. Despite his consistent high achievements throughout his course, the now-Honours student says he was surprised to hear he had won the medal. In his acceptance speech, Peter reflected on the huge changes that happened in the world during the three years of his undergraduate course. Peter Robertson receiving the Dean's Award from Professor Paul Kofman. “As I walked out of my intermediate macroeconomics exam, I learnt that Trump was likely to become President. In my winter holidays of second year, the Brexit referendum returned in favour of the UK leaving the EU. “We are beginning our lives and careers in what is undoubtedly a time of great change. What does that mean for us, past and present students of the Bachelor of Commerce?” Peter asked. “(With) each subject …there has always been a focus on the way we might be able to apply content learned in class to the real world. Reflecting on his Bachelor of Commerce, Peter says he especially enjoyed his elective subjects. “With my electives, I really enjoyed applied micro-econometric modelling - that was really awesome. It was the first time in my degree that we got to intensely interrogate the statistics in academic papers. A micro-economics enthusiast, Peter is keen to embark on an academic career after his Honours year, but is waiting to see how this year, and his thesis, pans out. Congratulations to all the students who received an award at the Dean’s Award Ceremony. You can see the full gallery of photos from the event on Facebook.